The "Tabea" while en route to New York had to make an unexpected stop in Bermuda on Oct 27, 2015, due to an injured crew member that required medical assistance. 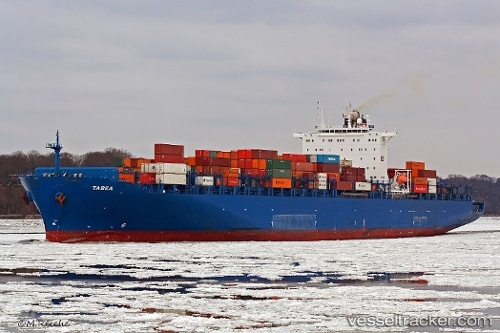 At 1.02am, RCC Bermuda was informed by the United States Coastguard District 5 in Norfolk, Virginia that the ship, which was located 86 miles west of Bermuda, en-route from Pecem to New York, wished to divert to Bermuda to transfer ashore an injured crew member. The 48-year-old Philippine national was suffering from a deep facial wound and required medical attention. Plans were put in place to transfer the patient from the vessel to KEMH via the Pilot Boat St. David at the Deep Draught Position offshore from St Georges Harbour. The vessel arrived at the position at 6.30 a.m., and a MEDICO transfer was made from the ship to the Pilot/Rescue Boat "St. David", and the injured crew member was then transferred to an awaiting ambulance at Ordnance Island.